Date: Saturday 21st June 12 noon until 4.30 pm. Penalty shoot out – football! Stalls, food and drink ……. *Alan Wright Photography workshops and Shoot your Favourate Pirate Competition. There will be two 20 minute workshops during the fete, whereby Alan will show the children some simple tips and tricks on how to capture great shots. 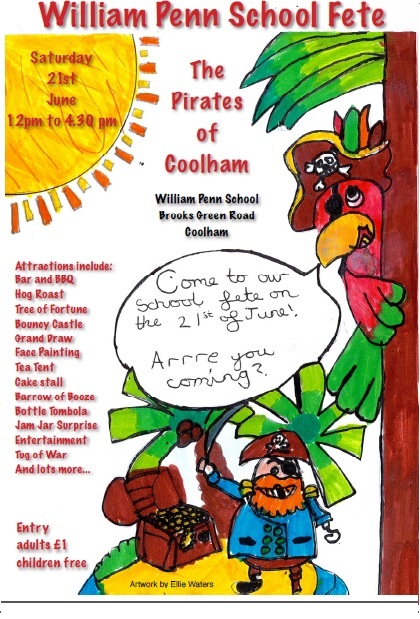 He will then challenge the children to go off for 10 minutes around the show and practice their new found skills in a competition to “Capture their favourate pirate or image which reflects Pirates of Coolham”. This will be followed by a study of the photos with the winner receiving a pirate prize at the end of the fete. Eco Arty Crafty fun at the William Penn Summer Fete. 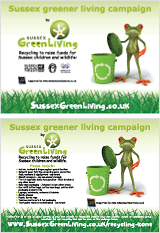 Children can either make their model before the fete and bring it along to our Eco Arty Crafty competition or bring the materials and join Carrie Cort in the Sussex Green Living Eco Art area to make your model on the 21st June. Towards the end of the Fete all the entries for the following 3 classes will be judged, the winner of each class will be entered (PTA will pay) into the relevant class at the Billingshurst Carnival competition…. Class 1 – Model from recyclable materials, on a base not exceeding 30cm x 30cm: Primary School Pupils (Billingshurst Carnival Class B2). Class 2 – Decorated Shoe Box: Primary School Pupils (Billingshurst Carnival Class B4). Class 3 – Scarecrow: Primary School Pupils – see images below… (Billingshurst Carnival Class D1). Freestyle or you might consider using up all those unwanted flower pots. This entry was posted in Eco School Sussex blogs, Eco School William Penn, Seasonal celebrations. Bookmark the permalink.